Blackwaterfoot has been a popular family holiday destination for many years, and the Greannan is an ideal location from which to explore the many local attractions and the Isle of Arran as a whole. 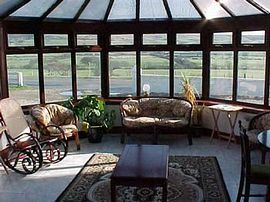 The Greannan is situated in an elevated position with panoramic views over the village of Blackwaterfoot and the Shiskine Valley. 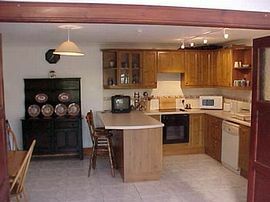 The property comprises of two self catering apartments. Scottish Tourist Board Grading 4 star. Scottish Tourist Board Grading 3 Star +. Family room - 3 single beds en-suite. Very close to the beach, golf course, shops and hotels. Well behaved pets are more than welcome. The lower apartment is all on one level. Linen, towels and tea towels are provided and included in the price. Well behaved pets are welcome prior to arrangement. The use of three lovely gardens and a bbq. 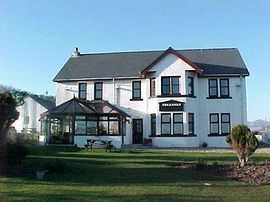 Local Services: The village of Blackwaterfoot on the Isle of Arran is 0.5 miles from the Greannan and has a butcher, bakery, hairdresser, newsagent, garage, licensed grocer/post office and hotels offering a wide range of meals one of which also boasts a leisure centre which is open to non members. Location: The Greannan is on the South side of the Shiskine valley approx. 0.5 mls outside Blackwaterfoot on the A841 towards Machrie. Lovely apartment and wonderful Island - Jenny and Tom from Leeds. Fantastic for families with the beach just a 5 minute walk down the road - we have booked up again for next year - The Moore family.